There’s an air of studio tradition surrounding The Legend Of Tarzan, and not just because a revival of the Edgar Rice Burroughs character is a classic executive gambit based on the misconception that audiences hunger for all old stories to be ceaselessly retold. There is that, of course, but this Warner Bros. production also emits a certain in-house enthusiasm—a summoning of Warner-based talent to take another shot at this Tarzan business. It’s directed by once and future Harry Potter wizard David Yates, features a posthumous producer credit for Jerry Weintraub (of the Ocean’s trilogy), and is packed with stars, including Margot Robbie, who—having filmed this in between Warner productions Focus and Suicide Squad—seems like a studio favorite. In other words, there’s a handsomeness to the enterprise—a confidence that seems to dissipate, or at least diminish, as the movie goes on. Maybe the strong start comes from a rush of relief that it’s not an origin story. The film joins Tarzan (Alexander Skarsgård) years after marrying Jane (Margot Robbie) and moving to London, leaving the jungle behind; he’s introduced sipping tea but maintaining a simian curl to his knuckles. Tarzan has reclaimed his identity as John Clayton, whose parents were shipwrecked in Africa and eventually killed in the jungle where apes would eventually raise their baby son. Clayton’s not eager to fulfill a request from the English government to revisit the Congo and assist the money-hemorrhaging king of Belgium. But George Washington Williams (Samuel L. Jackson) convinces “Africa’s favorite son” to make the trip to investigate his suspicions of slavery. These suspicions are particularly understandable given that Belgium’s primary enforcer, Rom, is played by Christoph Waltz as another chatty, even-keeled evildoer. He has his own reasons for luring Tarzan back to Africa. Jane, for her part, is less reluctant to revisit her jungle past, craving some corset-free adventure. The film works overtime to position Jane as a strong heroine who literally spits at the term “damsel,” but all of this effort serves only as an extensive justification for her use in that role. Tip to filmmakers endeavoring to undermine clichés: Having the damsel in distress escape before the hero rescues her is a decent twist. Having her recaptured shortly thereafter is not. Similarly, the movie positions Tarzan and Jane as friends to the African natives and in doing so renders said natives more of a vast collective than a group that might include actual characters, with the exception of vengeful Chief Mbonga (Djimon Hounsou). The bad blood between Mbonga and Tarzan is part of the movie’s bizarre strategy to undermine its intriguing years-later take on Tarzan with a series of sepia-toned flashbacks retelling bits of his origin story, albeit more concisely than a full origin movie would have told it. Yet all of the mildly retrograde backsliding in characterization and storytelling doesn’t fully damper the movie’s initial promise of adventure. In the early going, The Legend Of Tarzan is pretty fun, well-appointed cornball stuff. Yates doesn’t really have his own directorial signatures, but he’s a decent craftsman and lends the visuals some polish and clarity, even when the computer-generated effects don’t fully measure up. Yates’ Harry Potter movies tended to emphasize beloved characters over big-ticket action, and his direction of their flashiest moments needed only to improve on the sometimes-confusing action blocking from J.K. Rowling’s prose. 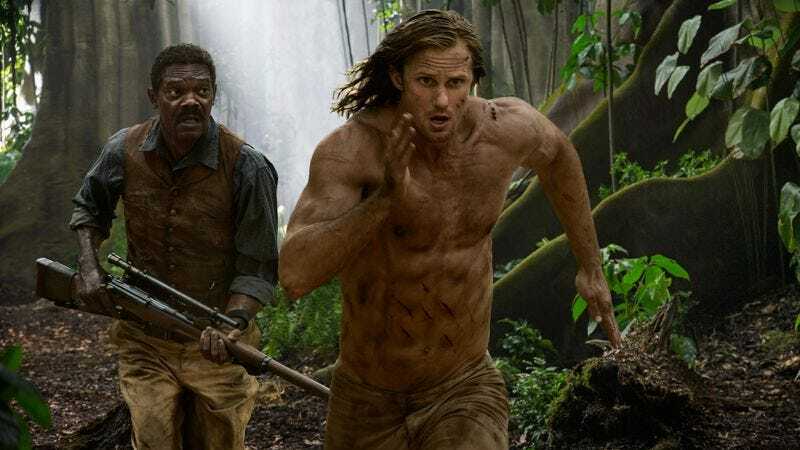 Tarzan, at least as played by Skarsgård, is more of a physically impressive cipher than a lovable hero, which places more importance on his actions—an area where The Legend Of Tarzan falls short. Tarzan’s vine-swinging never achieves the kind of fluidity seen in the Disney-animated version, and two big confrontations take place in front of the same waterfall, which through Yates’ eyes might as well be called Adjusted Shutter-Speed Falls. Without many binding action sequences, the movie draws more attention to its shortcomings, like the terribly limp banter between Tarzan and Williams, who serves as a competent but only semi-comic sidekick. Jackson keeps putting his heart into it, as he usually does, but Tarzan as a character doesn’t lend himself well to playful callbacks to earlier pithy exchanges (especially when said exchanges are not that pithy and said callbacks barely seem to amuse the people on screen). The movie tees up an exciting, likable yarn but never really takes off. Yates finally stages a pretty strong action sequence for its climax, featuring an animal stampede, a hail of 19th-century machine-gun bullets, and some impressive Tarzan acrobatics. Unfortunately, it arrives too late for the movie to become rip-roaring pulp. It’s nice that The Legend Of Tarzan isn’t a nakedly mercenary franchise play that presumes dozens of sequels to come. (It’s also not a low-rent Casper Van Dien vehicle.) But it sure could use some money-grubbing set pieces to tie the genial silliness together.